How did you spend your Sunday? In Kelsey Merritt’s case, she had a bomb workout sesh with Zac Efron and their friends at The Studio (MDR) in California. 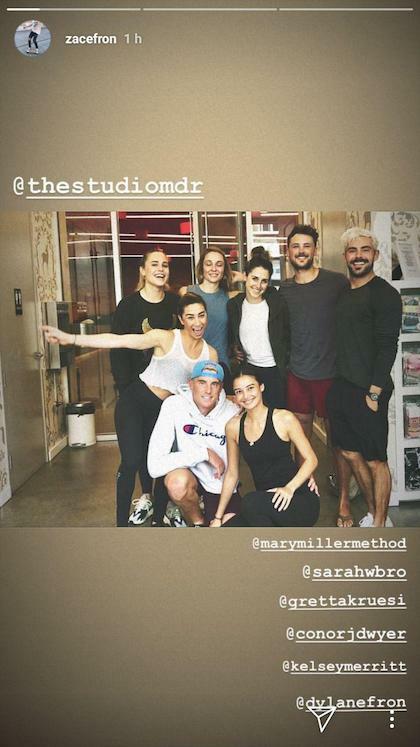 They took a pilates class by celeb trainer Mary Miller with Kelsey’s boyfriend, Conor Dwyer, Zac’s brother, Dylan Efron, Olympic swimmer Sarah Bro, and artist Gretta Kruesi. We know just how much the Victoria’s Secret model works out, but we have no idea where she gets her chill when “Z the machine,” as their trainer calls Zac, is around, looking like THIS. Their workout session follows their fun vacay in Mexico for Conor's birthday bash and a new year's celebration with friends earlier this month.